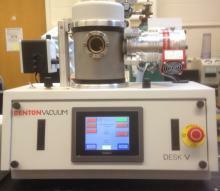 The Denton Desk V sputter coater is a high-vacuum coater, pumped by a turbo pump and scroll pump. This provides a cleaner, lower oxygen, deposition environment for depositing higher conductivity metals onto SEM samples for the removal of charge buildup during imaging. The standard metal for deposition is Au-Pd but different metals can be deposited depending on the available targets. An Iridium target is available for high-resolution imaging and a carbon evaporator attachment is also available. The sample stage rotates with planetary motion for more uniform and better conformal coverage and can be used in manual mode or automated mode with pre-programmed settings for repeatability. The Duffield Hall 231 microscopy facility also has an Edwards S150A Au-Pd coater. Please contact your SEM manager for instructions on use.